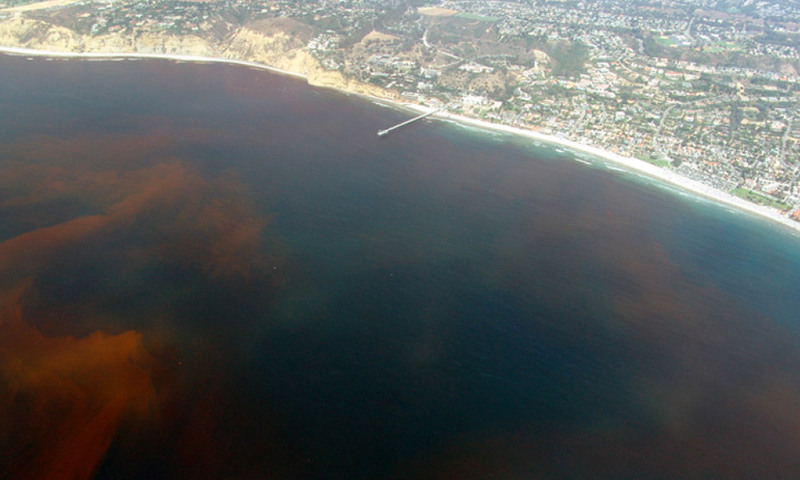 A red tide off the shore of La Jolla, California. Could Ocean Fertilization lead to toxic plankton blooms? Researchers suggest that the risk is real. OF proposes that dumping iron or urea into the ocean will reduce atmospheric CO2. Russ George reappeared a few years later with the Haida Salmon Restoration Corporation, which pitched OF to boost salmon populations off the Haida Gwaii archipelago. In 2012, they dumped 100 tons of iron sulphate in the Pacific Ocean off the west coast of Canada – the largest-ever OF dump. An international outcry led to an investigation by Environment Canada’s enforcement branch, which has yet to conclude its efforts. Researchers have suggested that ocean fertilization could have damaging effects, including deep ocean oxygen depletion, harmful algal blooms and disruption of the marine food chain. One of the first large experiments in OF was the 2009 LOHAFEX expedition, in which researchers, co-sponsored by the Indian and German governments, dumped six tons of iron sulphate over 300 km2 of open ocean east of Argentina. Numerous outdoor OF experiments have taken place, aided by the fact that such experiments are logistically simple to execute. There are more experiments in the pipeline. Most prominent are plans by Oceanos Marine Research Foundation to conduct experiments off the coast of Chile in 2018. CBD’s Scientific Synthesis of the Impacts of Ocean Fertilization on Marine Biodiversity. Pingback: Klima der Gerechtigkeit | Zum Tag des Meeres: Was ist marines Geoengineering und warum ist das problematisch?